I saw a story on the news last night about a 9-year-old girl in Texas who is learning to tattoo. (Not anentirely new story, as I found out when I did a Google search today.) Watching it left me with mixed emotions. While I’m all in favor of this girl going ahead (and of course having a father who owns the tattoo shop makes it spectacularly easy for her) I wonder if the widespread publicity won’t lead other people to believe that if a kid can do it, anyone can. I read several boards and blogs devoted to body art and from what I’ve read there (I have no personal experience with this) it’s not easy to get an apprenticeship. I do know that the apprenticeship is vitally necessary, because there is a lot more to being a tattoo artist than the general public realizes. (We multicolored people are much more likely to understand.) It’s not just a matter of learning to color inside the lines with a buzzing needle–there are health and safety issues that are of vital importance. And the girl herself isn’t quite ready for prime time. Her dad has to support the needle apparatus because it’s too heavy for her to hold, and her designs are about what you’d expect from someone her age. But she’s growing, and both her hand strength and designs will improve over time if she keeps at it (the nationwide publicity might well insure that she keeps at it, too). So I’m torn between cheering for the girl who has already gotten a foot in the door (OK, if your dad owns the shop, it’s not exactly tough) and who may inspire other young people to consider tattooing as a profession, and wondering whether the publicity surrounding her will convince people that there’s nothing special about tattooing if a kid can handle it. Have you seen the story? What did you think? 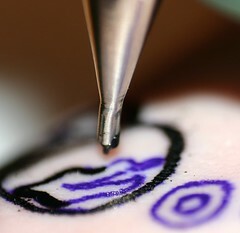 Here is about.com’s Karen Hudson’s common sense guide to becoming a tattoo artist. Great blog, and well laid out. That’s a thought! Granny’s Tattoos. That sounds good to me. I need to start drawing again! My *only* issue with a kid that young tattooing is that time might be better spent cultivating artistic talent–learning about anatomy, how lines flow on paper (and how it will differ on the body), how to create movement in a static image…a really good tattoo goes beyond basic drawing, and I’d like to see the kids who have that talent be pushed more towards developing their skills as an artist before they start working on their skills with ink. They can learn to tattoo after they’ve learned a whole lot more about art. Otherwise…why the heck not? It’s not like anyone is going to force a customer to get ink from a kid. One of the things I have on my “upcoming post” list is how drawings on paper can be different from drawings on skin. I started out in college as an art major but my skills have gotten way rusty from not practicing over the years and I want to get back in gear with drawing again, and looking into paper art vs. skin art is part of the process. I can’t imagine any reason why Lilly (shown in the video) shouldn’t or couldn’t follow in her dad’s footsteps … I mean there’s not going to be too many kids out there learning to tattoo so young but to those who do it’s freakin awesome to pursue anything so young! Music, art anything! All the best to Lilly and her folks! I agree, it’s really awesome for someone to be able to start so young and obviously do so well at it. Your daughter’s on her way to being a superstar! We also own a tattoo shop and our 7 almost 8 year old is a great artist and has won awards already… she is super crestive in all artistic ways… and she is very inspired by her daddy to tattoo… and has given her dad and I both a tattoo a few weeks ago… under very close supervision (and help of course) and she wants to be a tattoo artist also… I can’t imagine any reason why Lilly (shown in the video) shouldn’t or couldn’t follow in her dad’s footsteps … I mean it’s not going to be too many kids out there learning to tattoo so young but to those who do it’s freakin awesome to pursue anything so young!